Though the world is better prepared for the next pandemic than ever before, it remains highly vulnerable, especially to a pandemic that causes severe disease. Nothing about influenza is predictable, including where the next pandemic might emerge and which virus might be responsible. The world was fortunate that the 2009 pandemic was relatively mild, but such good fortune is no precedent. While the point being made here by the WHO is that we could easily be blindsided by a newly emerged or recently mutated influenza strain, that isn’t the only way we can be caught off guard by another global health emergency. There is nothing new in the fact that many countries endeavor to `manage’ the release of bad news to their best advantage, but these past six months have seen an noticeable escalation in `strategic reporting’ from two of the hardest hit bird flu regions in the world; Egypt (H5N1) and China (H7N9). The size and trajectory of both avian flu outbreaks have been difficult to gauge due to their respective MOH’s decisions to delay, or withhold information. Neither of which imbues one with a lot of trust regarding what little they do report. The reporting on MERS cases out of Saudi Arabia, quite frankly, won’t win any awards either. But at least they do report on a daily basis (most of the time). And there are a lot of countries from which we hear little or nothing (think: Indonesia, Cambodia, North Korea, etc.) that may or may not be dealing with outbreaks. While we can always hope that `no news is good news’, experience has often shown otherwise. 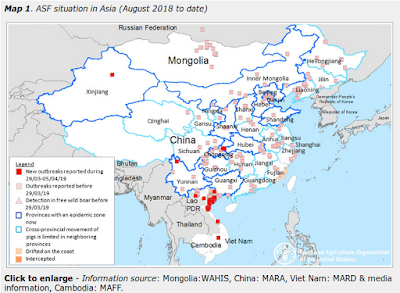 Granted, the WHO, FAO, and other agencies do post outbreak summaries (constrained by whatever information is provided and authorized for release by these reporting countries), but they are often delayed, redacted, or woefully lacking in details (see WHO: A Very Brief H7N9 Update – China). There are legal requirements for reporting, but the reality is, we are a long way from having any semblance of a working, global, cohesive disease surveillance system. In 2005 the World Health Organization adopted the IHR (International Health Regulations) that – among other things - requires countries to develop mandated surveillance and testing systems, and to report certain disease outbreaks and public health events to WHO. That extension – not to exceed two years – expired last summer, but by February of 2014 the writing was already on the wall, and another 2 year extension was authorized (see WHO: IHR & Global Health Security) pushing the deadline for final implementation of the IHR to 2016. While this year’s WHA has ratified the Committee’s recommendation to extend the deadline to 2016 to all countries that need more time to implement the Regulations, there is already talk of needing another extension. I suspect when the phrase `herding cats’ was first coined, it was in reference to getting 190 politically motivated member nations of the World Health Assembly to buckle down and actually complete a common (and badly needed) goal. Last February’s WHO warning was specifically about the ability of influenza viruses to evolve unpredictably and surprise us.